What do you see when you imagine your ultimate beach? It might include warm sun rays and hammocks, or you could also be envisioning massive waves and an endless pristine beach. Whichever the case, you’ll have to admit that beaches are a lot of fun, and they’re also great for a peaceful retreat. We understand that you’ll have your personal preference when it comes to your beach getaway, and that can range from the location to accommodations to even the local culture - so we’ve listed down a few (and it’s really worldwide!) that we’ll hope will inspire your next trip. Ever seen pink sand before? And no, we’re not talking about shocking pink, but a beautiful soft color that’s just relaxing to look at. Here at Horseshoe Bay in Bermuda, you’ll get to enjoy this wonderful hidden feature at Port Royal Cove. Shallow waters make it the perfect place for families with young kids, and dramatic rock formations give the entire scenery a truly magnificent finishing. Some beaches seem to end almost immediately, but when it comes to this six-mile- long one in Jamaica, you’ll get to explore quaint fishing villages as well as explore plenty of swimming and snorkelling spots all along the coastline. It’s not particularly popular with tourists, and that’s definitely not a bad thing since you can have all the peace and quiet you’ll ever need. You might already be familiar with the beaches in Bali, but have you ever heard of Ora Beach in Maluku, Indonesia? Well, if you haven’t, it’s high time you took this opportunity to explore its emerald ocean waters. It’s still relatively unknown, so if you’re looking to just float peacefully in the water and marvel at the clear sky, this is the place for you. Australian beaches aren’t just know for their fantastic surfing opportunities. In fact, this four-mile, eco-friendly beach is a great spot for tons of other water activities and mind-relaxing ones. The beach is amazingly white, and it’s due to the overwhelming composition of white silica in the sand. It’s located in quite a remote location, so you’ll get plenty of “me” time all to yourself. 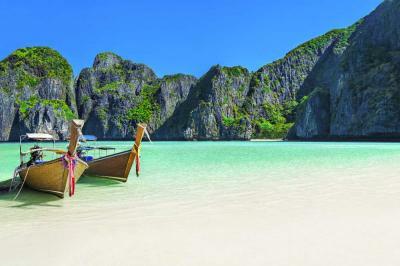 Certain locations are too good to pass up for a movie, and Maya Bay in Thailand has already been featured in dozens of films for good reason. Sure, it might be thronging with a steady stream of tourists every year, but that doesn’t make the location any less beautiful. The sand is so soft you’ll feel like you’re walking on a comforter, and with the turquoise bay greeting you upon arrival, this is as close to heaven you can get. So, have you decide on your next tropical getaway? If you’re ever in need or want of a comfortable ride to the airport at any time of the day, you can definitely reach out to our Destin limo service. Our chauffeurs will be more than happy to have you on board of any of our comfortable vehicles, so don’t hesitate to reach out to the best limo service Destin FL has to offer at any time.